SGS has an international-class campus spread over 10 acres in close proximity to Visakhapatnam steel plant. An infallible system of 24/7 security of the campus is ensured by trained security personnel. The school campus has been aesthetically designed. 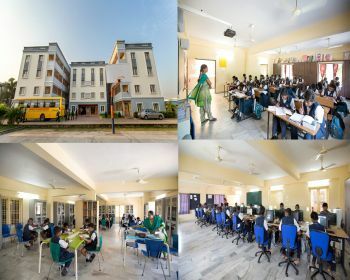 A campus, complete with spacious e-classrooms, multimedia library, computerized labs, language lab and integrated science lab and conference rooms form our academic infrastructure, which is at par with international standards. SGS prides itself in providing extensive sports venues like swimming pool, toddler’s pool, 200 meter athletic track, outdoor games field, tennis /badminton /basketball, a shooting range, and a horse riding track. The ‘Green Campus’ concept has been employed in the planning and construction of the school. The highlights of this approach include the use of fly ash in building material, solar heating, water harvesting, recycling of waste, effluent treatment, plastic free & chemical free landscaping..
A hygienic dining hall with a good seating capacity has been designed to make lunch hours comfortable and enjoyable. In congruence with the policy of healthy eating, the school does not provide ‘junk food’ and aerated drinks. SGS provides the best international standard boarding facilities. The designing of our hostel rooms give enough space to children to help them create their own personal identifying domains. Along with this, the humongous common room with a LCD, computers and a few indoor games like chess and carom board, assists in their recreation.